Mini released these photos of its lightly camouflaged two-passenger Coupe. The two-seater Mini Coupe concept that debuted almost two years ago at the Frankfurt auto show has become reality. 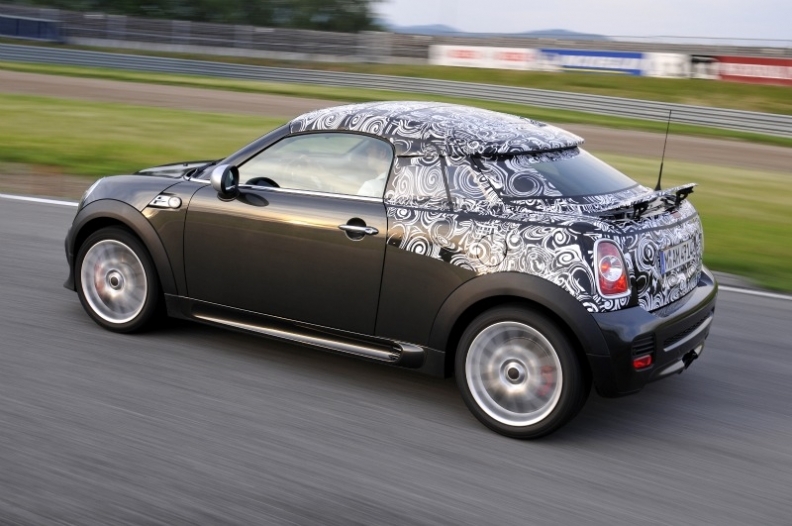 Photos released by Mini show a lightly camouflaged car that will be known as the Mini Coupe. This is the first two-seater Mini since the brand relaunched in 2001. The car will be offered with a lineup of potent four-cylinder engines, including a range-topping John Cooper Works variant producing 208 hp from a 1.6-liter twin-scroll turbo with direct injection. The Cooper S model will produce 181 hp, also from a twin-scroll turbo four, and the base unit will produce 121 hp. The Mini Coupe is the first two-seater Mini since the brand relaunched in 2001. 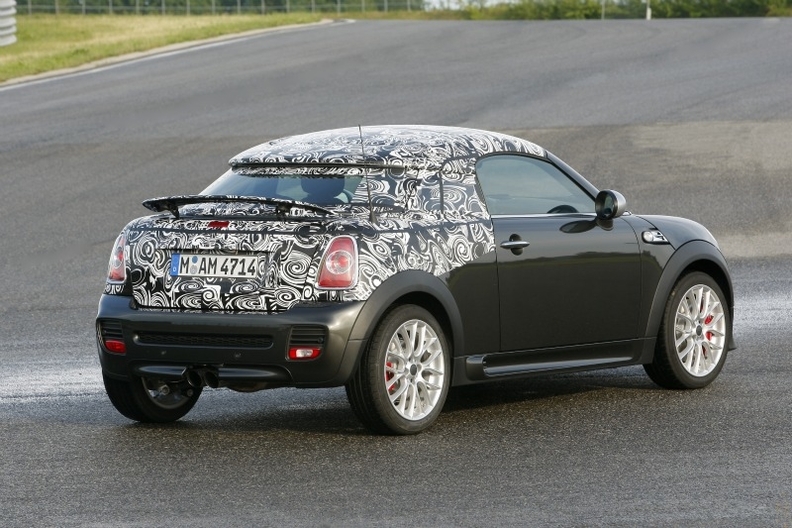 A six-speed manual gearbox will be standard, with a six-speed automatic an option on some versions of the Mini Coupe. Mini paid attention to the chassis setup in keeping with its tradition of go-kart driving character. 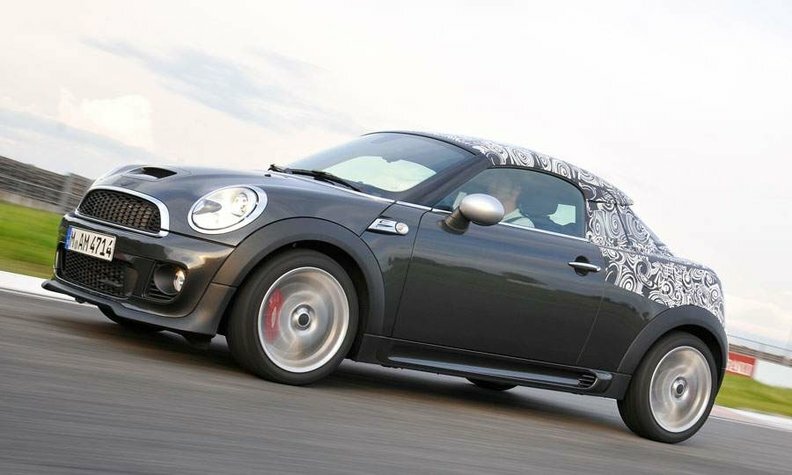 Wheel packages range from 15 inches on the standard Mini Coupe to 17 inches on the John Cooper Works model. An optional sport suspension returns a firmer drive, Mini says, and a Works suspension lowers things by 10 millimeters. The Mini Coupe is fitted with a rear spoiler that's automatically deployed at speeds of 50 mph—the first Mini to get such technology. The styling is typical Mini, with the familiar headlights and grille accenting the brand's slight but distinctive proportions. The Coupe gets what Mini calls a "three-box" layout, which differs from other models in the line. Three boxes account for the engine compartment, passenger area and trunk. Also of interest, the Mini Coupe is fitted with a rear spoiler that's automatically deployed at speeds of 50 mph—the first Mini to get such technology. The Coupe will go on sale in Europe on October 1 and will cost ''a little bit more than the Hatchback,'' BMW, which owns the Mini brand, told Automotive News Europe.